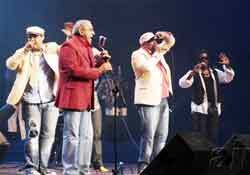 On Sunday, Cuba's most famous dance band Los Van Van held a successful performance at the James L. Knight Center in downtown Miami. Responding to the controversy surrounding their performance, band leader Juan Formell said that they had only come to the United States to do music. He said that although he has his own political views, he does not intend to promote them. ``We didn't come to the U.S. to do any kind of politics or ideology or anything like that,'' he said. “All Cubans are my brothers,'' said Van Van singer Mario ``Mayito'' Rivera, a Cuban flag draped over his shoulders, during an emotional performance of Soy Todo (I'm Everything), a signature Van Van song that calls out to Cuban cultural and spiritual roots. “We are Cuban'' was the phrase of the night, both from the band that has ruled popular music on the island for 40 years and the euphoric audience of almost 3500, mostly Cuban exiles, at the Knight Center. The group which won a Latin Grammy in 2000, will travel next Thursday to Puerto Rico and on February 13 they’ll be in Peru. In March the group will tour Denmark, France, Germany, Austria, The Netherlands, the Czech Republic, Spain, the United Kingdom, and in May they will be returning to the Unites States.